Inspection, Percussion, Auscultation - is the most important, Palpation. The other examination techniques are only supplementary. Visible beat of the apex (in left ventricle hypertrophy and dilatation, in hypertension, ischaemic heart disease, front wall aneurysm following a myocardial infarction, aortic defects, mitral insufficiency). Appearance - facies mitralis (dark red spots in cheeks combined with acral cyanosis). Brownish coloration (white coffee) in the face - subacute endocarditis. Arcus senilis lipoides corneae (greyish lining of the corneae) is a manifestation of hyperlipoproteinaemia. Xanthelasmata (fat deposits in the region of upper and lower eyelids) - danger of ischaemic disease. 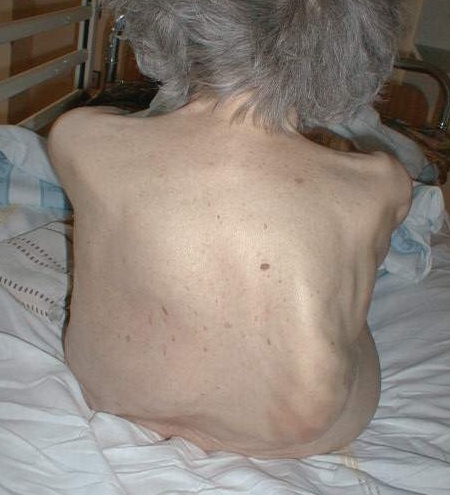 Increased filling of cervical veins, hepatomegaly, and lower extremity oedema, i.e. the triad of the right heart failure. 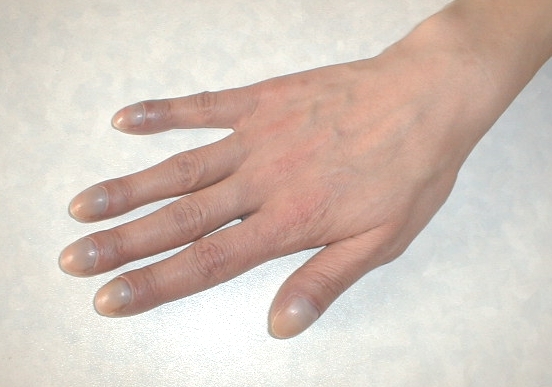 Digital clubbing, nails resembling the shape of a watch glass - cyanotic congenital cardiac defects. Splinter haemorrhage - located near the base of the nails in infectious endocarditis. Osler nodes (painless red nodules in the pads of fingers or palms) - manifestations of infectious emboli. 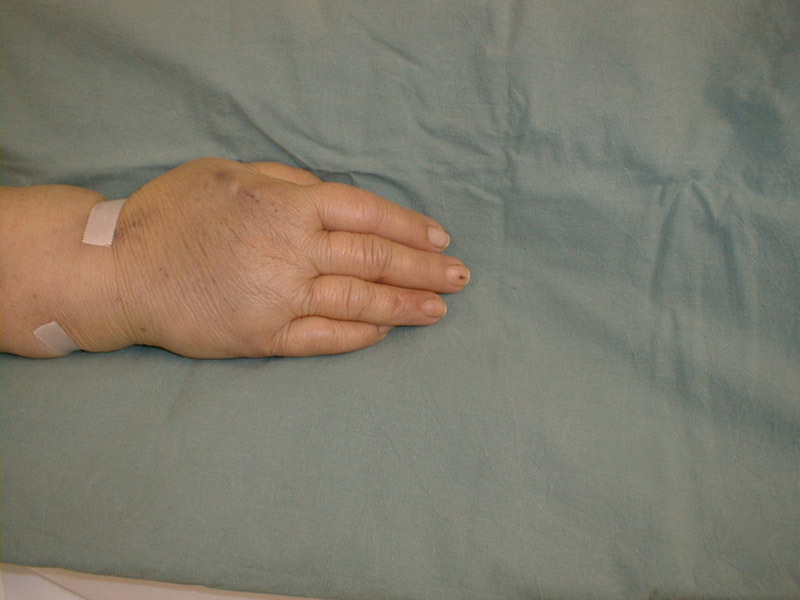 Arachnodactyly (spider finger) - in Marfan´s syndrome. Provides a general orientation to determine the size of the heart (better X-ray picture of the heart + lungs, echocardiogram). Determination of the left heart margin - it should not exceed the midclavicular line. Under normal conditions, the beat of the heart apex is felt in the 4th - 5th intercostal space on the medial side of the midclavicular line. In left ventricle dilatation, the beat of the heart apex is shifted the left and downwards. In left ventricle hypertrophy the apex beat is ascending. In right ventricle dilatation and hypertrophy, the heart apex is shifted to the left, simultaneous occurrence of the systolic rising of the sternum and pulsation in the epigastrium (because the hypertrophic right ventricle leans against the front thoracic wall). In extensive aneurysm or dyskinesia of left ventricle front wall, systolic pulsation can be felt along the left margin of the heart. Diastolic whirl in the region of the apex in mitral stenosis. Systolic whirl over the aorta propagating to the carotid arteries in aortic stenosis. Systolic whirl along the left margin of the sternum - septal ventricular defects. There are two types of stethoscopes used - membranous (transmits better high frequency sounds and bell-shaped (for listening to low frequency sounds and murmurs, e.g. the 3rd sound, 4th sound, and diastolic mitral and tricuspid murmurs). Auscultation is of great significance - the most important physical examination of the heart (see the picture Auscultation points on the chest, sounds). This is produced by closing of the mitral and then tricuspid valves at the beginning of ventricular systole. This is produced by closure of the semilunar valves, firstly the aortic and secondly the pulmonary (changes with respiration). In expiration, both components are getting closer together; in inspiration they are moving away - the physiological segregation of the 2nd sound. It is due to the fact, that in inspiration, the negative intrathoracic pressure is intensified, the return to the right heart increases and the increased stroke volume of the right ventricle prolongs its ejection and therefore leads to a delayed closure of the pulmonary valve - e.g. in BRTN (block of the right Tawara´s node) in ECG, in atrioseptal defect etc. NOTE - in pathological conditions, the paradox split of the 2nd sound occurs if the left ventricle is overloaded and its systole is prolonged (e.g. aortic stenosis, ischaemic heart disease, BLTN - block of the left Tawara´s node in ECG) - closure of the aortic valve is delayed, firstly the pulmonary, then the aortic component. Therefore, in inspiration the 2nd sound is paradoxically split, in inspiration the two components are moving away (i.e. the aortic component and the pulmonary one physiologically), so that they merge. 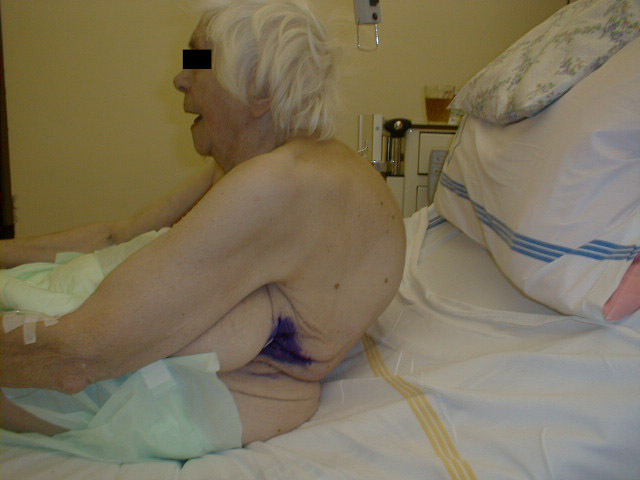 It is audible in patient lying on the left side, at the apex, with the bell-shaped stethoscope. In elderly patients in pathological conditions it corresponds with low frequency -protodiastolic gallop (in failing heart). It is audible in the patient lying on the left side, at the apex, with the bell-shaped stethoscope. It is elicited by vibrations of the ventricular myocardium on ejection of the blood into the ventricle during the ventricular systole at the end of diastole; but it is absent in atrial fibrillation!!! It is found in young healthy people or in elderly patients as the presystolic gallop. Concurrence of the 3rd and 4th sounds in cardiac insufficiency is called the summation gallop. NOTE! IT IS ALWAYS AN IMPORTANT SIGN OF THE LEFT VENTRICULAR FAILURE! Systolic clicks are accessory sounds produced during the systolic phase by the valvular activity. Ejection aortic click corresponds probably with sudden distension of the aortic valve. It occurs in early systole and is of a sharp clicking character. It is best audible in the apex region in dilatation of the aortic root, regardless of the cause of dilatation. Systolic click may occur also during the midsystole or late systole, it sounds like a short, dry whip crack and can be multiple. It is caused by an abnormal function of the mitral valve and it is considered a sign of mitral valve prolapse. Ejection aortic and systolic clicks are often confused. Systolic click occurs later during the systole and in inspiration approaches the 1st sound. Murmur - an acoustic phenomenon produced by vibrations of the valvular apparatus or another structure, if the laminar blood flow is replaced by turbulent circulation. lasting the whole systole (holosystolic). 6th grade - distant murmurs, i.e. audible without placing the stethoscope on the chest. 4th to 6th grade murmurs are usually connected with the palpable whirl. The 2/6 murmurs indicate the 2nd grade intensity out of the given six grades. Loudness of the murmur is usually proportional to the velocity of blood stream between the two cavities. Velocity of the blood movement depends on the pressure gradient over the ostium, on the shape of the ostium and size of the minute volume. In general, loud murmurs occur in a higher gradient, smaller ostium, or greater minute volume - e.g. a small ventricular septal defect elicits a very loud systolic murmur (great pressure gradient over the defect). In exertion, murmurs are intensified, but in heart failure they remain unchanged. Diastolic murmur in mitral stenosis is better audible in the position on the left side and following exercise. Diastolic murmur in aortic regurgitation is examined in the sitting patient, slightly bent forwards. Murmurs from the right heart are intensified in inspiration and they get reduced in Valsalva manoeuvre. Left heart murmurs are accentuated in expiration. Accentuation of the 2nd sound over the aorta is a manifestation of hypertension in the systemic circulation. a) Dry pericarditis cracking sound like walking on newly fallen snow. 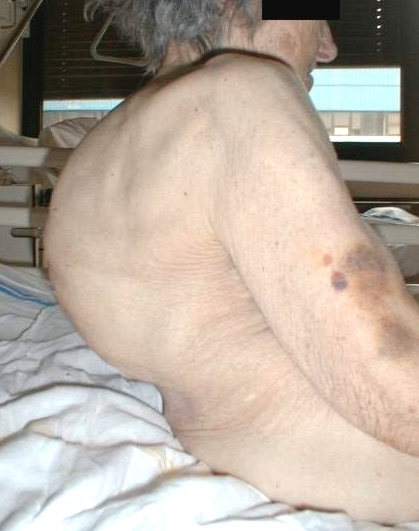 as postpericardiotomic syndrome (following cardiac surgeries).